VICOM has announces that an automated calibration program is now available for the 12000A microwave synthesiser from Giga-tronics Inc, a leading manufacturer of RF and microwave test equipment for cellular, PCS, radar, defence and satellite systems. The fully automated software program is a time saving and cost-effective way to fully calibrate a microwave synthesiser, in-house. 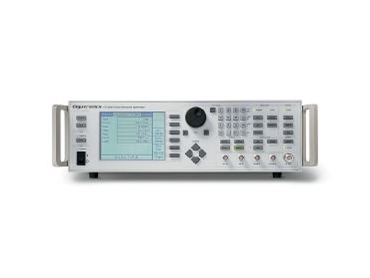 The 12000A calibration program provides complete calibration of the model 12000A microwave synthesisers. Design of the 12000A series synthesiser includes extensive use of digital circuitry and requires no manual adjustment of potentiometers. The calibration program consists of software that automatically measures and adjusts all critical internal circuits. For the non-modulated model 12400A, the only equipment required is a PC, a Giga-tronics power meter and source (additional equipment is required for other models). Calibration performed covers time-base and ALC (all models) and modulation on models 12500A and 12700A. The 12000A microwave synthesiser features less than 500μs frequency switching speed. A unique frequency ramp sweep combines analog speed with digital accuracy for faster more accurate signal generation, low phase noise, high output power and excellent frequency linearity. Digitally controlled circuits and surface mount components provide high reliability and stability.